The Zodiac killer inspired many fictional villains in books, television, and films. In 1971, a San Francisco theater showed a low budget film titled The Zodiac Killer. Director Tom Hansen hoped that the movie might attract the real Zodiac killer to the theater. Moviegoers were asked to answer the question, “I believe the Zodiac killed because…” The written answers were examined for any similarities to the distinct handwriting of the Zodiac. The plan was unsuccessful, although Tom Hansen believed that he may have encountered the real Zodiac killer. Several months after the brief run of The Zodiac Killer, a blockbuster film opened across America and forever changed the action genre. Dirty Harry was an instant hit, inspired four sequels, and cemented actor Clint Eastwood’s image as the all-American hero with a gun. San Francisco cop Harry Callahan carried a mammoth 44. magnum pistol and had little use for the rules when pursuing his prey. Eastwood’s legendary performance and quotable quips created a new standard for action stars repeated in countless imitations. Clint Eastwood’s vigilante cop persona was only justified in balance by the extreme nature of the villain driving the story to its violent conclusion. Actor Andrew Robinson co-starred as the deranged killer who called himself “Scorpio” in handwritten letters sent to the San Francisco Chronicle newspaper. Like the Zodiac, Scorpio (Andrew Robinson) taunted police by telephone. Chicago Sun Times film critic Roger Ebert wrote that “Scorpio is portrayed as the most vicious, perverted, warped monster we can imagine.” Many moviegoers did not realize that Scorpio was based on the real-life monster known as the Zodiac killer. Eastwood’s character was reportedly based in part on SFPD Inspector David Toschi, the investigator leading the hunt for the Zodiac. Scorpio’s handwriting resembled his real-life counterpart, and his letters echoed the Zodiac’s words in ominous threats to kill innocent victims if authorities did not comply with his demands. Like Zodiac, Scorpio also hated San Francisco police. Scorpio’s handwriting was similar to the Zodiac’s, and his threat to kill again if authorities did not do as he instructed was reminiscent of Zodiac’s first letter threatening to kill again if his letter was not published by the San Francisco Chronicle and other newspapers. 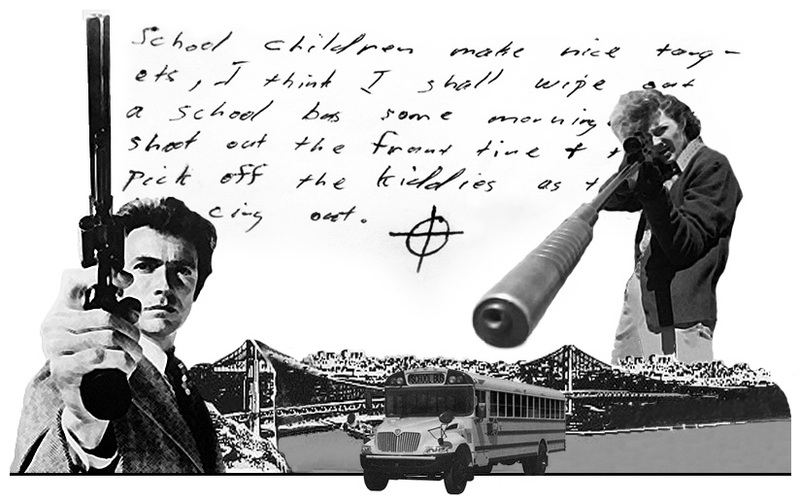 The final confrontation between Callahan and Scorpio was also inspired by the Zodiac’s infamous threat to kill children on a school bus. Zodiac warned that he would shoot out the tires and then shoot the children. Scorpio hijacked a school bus and held the children for ransom. The mayor and police superiors ask him to deliver the ransom money, but Harry has reached his limit. He sets out to end the reign of terror and stop Scorpio by any means necessary. Harry literally jumps onto the hijacked bus and forces Scorpio to flee. The killer uses a school boy as a shield but the enraged cop simply shoots Scorpio in the shoulder and knocks him to the ground. The inspector delivers his final monologue/catchprase, “You have to ask yourself one question, ‘Do I feel lucky?’ Well, do ya’, punk?” Scorpio reaches for his gun, but Harry fires his trademark .44 pistol and kills the maniacal psychopath. Scorpio’s bloody rampage and Callahan’s brutality fueled debate about the film’s message and the politics of depicting police as lethal vigilantes. The film was based on an original script titled Dead Right by Harry Julian Fink and Rita M. Fink, but the Callahan character and story changed many times while the project moved through various elements of development with several actors considered for the title role, including Frank Sinatra. Writer John Milius, a self-described “right-wing extremist,” wrote one draft of the screenplay, and his political views shaped Harry Callahan’s image. Milius described his contribution to the film as “[a] lot of guns. And the attitude of Dirty Harry, being a cop who was ruthless. I think it’s fairly obvious if you look at the rest of my work what parts are mine. The cop being the same as the killer except he has a badge.” Milius claimed that the film was “more important than The Godfather.” Film critic Gene Siskel wrote that the movie was “dangerous” and Roger Ebert bluntly characterized Dirty Harry as fascism. Dirty Harry grossed more than $35 million dollars in its first release and generated worldwide publicity when critics and protestors were outraged by the cinematic carnage. The commercial success and the controversy of the 1971 film did not provoke any response from the Zodiac killer. In 1974, a series of suspected Zodiac letters arrived at the offices of the San Francisco Chronicle. The writer described the blockbuster demonic possession film The Exorcist as the best satirical comedy and also complained about the glorification of violence in the newspaper advertisements for the movie Badlands about the true story of the killing spree by Charles Starkweather. Despite his apparent interest in movies, Zodiac never mentioned Dirty Harry or Scorpio, the fictional killer he had inspired. Decades later, in an ironic twist, the 2007 film Zodiac included a scene featuring SFPD inspector David Toschi at a San Francisco theater during a screening of Dirty Harry. The real-life Zodiac killer and the movie he inspired are now legends in American popular culture. Dirty Harry has become the personification of justice delivered through the barrel of a smoking gun, and the Scorpio killer is celebrated as one of cinemas most memorable villains. Unlike Scorpio, the Zodiac escaped justice for fifty years, and his shadow still haunts the streets of San Francisco. John Milius quote: Thompson, Richard (July 1976). “Stoked”. Film Comment 12.4. pp. 10–21.